Greenhills faculty, R. Charles Dershimer in 8th grade science and I (a member of the upper school English Department), were recently awarded a grant from the Michigan State University (MSU) Knight Center for Environmental Journalism. 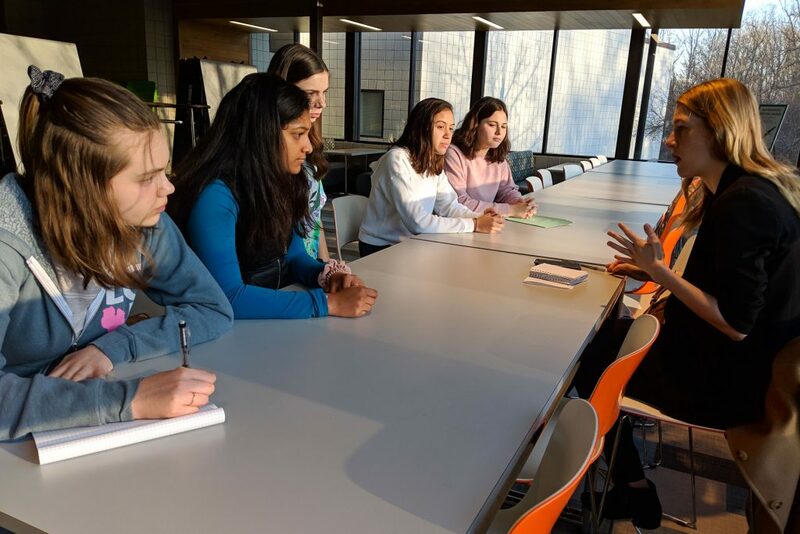 This grant provides funds for the faculty to design new curricular activities for engaging science and journalism students in inter-age conversations about sustainability and climate change. The MSU Knight Center has also arranged for a professional journalist, Darcie Moran of MLive and The Ann Arbor News, to serve as a project mentor. Darcie Moran, of MLive and The Ann Arbor News, discusses a group’s project with them. Charles and I plan to create a mentoring collaboration between students in the 8th grade science class and in the upper school journalism class, using journalism to support student engagement and empathy for environmental topics raised during the semester-long Sustainability Action Project (SAP). During the SAP, all 8th grade students are given an opportunity to understand the issues surrounding sustainability on a local, national, or global problem of their choice. Students identify and research a sustainability issue associated with food, energy, transportation, their community, or the environment, where sustainability is defined as “meeting the needs of the present without compromising the ability of future generations to meet their own needs” (Brundtland Commission, 1987). Students develop an action project that addresses their chosen problem, designing a sustainable solution while addressing the tradeoffs that help balance both current and future needs. The project ends with a report and a public presentation. While the SAP project has been successful in the past with students learning much about their chosen topic, the process does not always ensure larger engagement between student topics and the Greenhills school community. This grant will allow faculty like us to prototype a modification to the current SAP process, using environmental journalism as a way to ensure a greater impact on student engagement with empathy for sustainability. and promote student agency around their ability to make a difference and affect change as the journalism students do in-depth reporting on key projects, including getting public feedback on how their journalistic work affects the local community. In the fall of 2019, Charles, a group of students, and I will travel to MSU to present Greenhills students’ work to MSU’s environmental journalism faculty and college students. This visit also includes a tour of the Journalism School and one or two environment-related facilities on campus. Student work will be published on the Knight Center website and may also be published in the Great Lakes Echo, the MSU regional environmental news service. And of course, student work will be published at Greenhills through The Alcove, our student-run newspaper, as part of the GH Living and Sustainability sections.